Some nice pro pics from the show at the Highline Ballroom in New York on August 1. The look of Proto 3 is really starting to grow on me. The look of Proto 3 is really starting to grown on me. I really dig the look of it myself. It's about as hot-rodded as a real Strat (with the proper and officially licensed headstock) can get, which really was what the original Charvel guitars were to begin with. It doesn't look like the typical pointy 24-fret shred guitar at all. Agreed - It doesn't look like a typical shredder guitar, which I guess aesthetically sits better with Guthrie's competence in so many different styles. Are those little dots next to the knobs just position markers? I do find knowing where my volume knob is set, to be quite useful. Do you know if the final version will be painted, or is he liking the oiled finish more these days? Personally, I liked the nitro finish on the last incarnation of his Suhr signature, not from some snake-oil "it lets the guitar breath" perspective, but because I like the way nitro ages. Yes, Guthrie is not a shredder although I suppose he can "shred" with the best of 'em if that is what the music requires. It's become such a bad word within the guitar community that I don't see how anyone wants to be associated with it. And I think the same can be said of guitars that are typically associated with the term "shred". The Strat has encompassed so many genres and styles over the years and this guitar is essentially a real Strat, albeit a heavily hot-rodded one - the original and true superstrat. It embodies the age (early-80's) when players and guitar techs modified and hot-rodded the Strat to get more sounds and functionality out of the guitar and Grover Jackson and Wayne Charvel were at the forefront of that trend. As far as those dots next to the knobs, I believe that's what Guthrie and Charvel are working on. It's one of those minor details that they're still homing in on. I think it will remain as is as far as the finish is concerned - natural oil finish. It feels great and you don't have to worry about little dings and scratches without going the artificially aging route. As Guthrie said in one of the interviews about the guitar, it's pretty but not annoyingly pretty. It's much more subtle than heavily figured tops with bright colors that scream: "Look at me! Ain't I so pretty?". I myself don't care for fancy quilted/flame maple tops anymore. You go through the phase of wanting the most outrageously figured tops for a while and then grow out of it. I've come to view fancy tops like makeup women put on their faces or jewelry they wear, etc. It's just not that important in the big scheme of things. Anyway, that's my take on it. Agreed. Ultimately, guitars are for playing. In the process, particularly in a live setting, they may take the odd knock. That's life. Especially if you're a pro musician. Hey Johnny, you and I definitely see things through the same set of binoculars. You know, when I was running Tone Merchants, it was all about getting guitars with the most amazing tops. I did run into some people who said those types of tops were "gay" and stuff like that ("doctor and lawyer guitars") but I didn't care. I kind of understood what they were getting at but I still wanted the most beautiful tops possible. But as time went by, I started getting it. And I realized that Guthrie was also getting uncomfortable with the first Suhr GG Signature Model guitar with the beautiful flame maple top. Even he was getting somewhat paranoid about getting dings, scratches and dents on it during the tours. And I'd see him on some gigs with it and the guitar would gleam so gloriously and, honestly, it really didn't fit who he was - both as an artist and as a person. Yup, I absolutely agree that obsessing over details like the figuring of the tops, the gold hardware, the look and position of the inlays, etc. totally misses the point of playing the guitar in the first place. It's one of the main reasons I really didn't want anything to do with the "boutique" side of this biz anymore. Now I'm at Guitar Center corporate dealing with logistics, QC, operations, sourcing from overseas, etc. on a huge scale and I absolutely love it. It's so refreshing with mathematical clarity in what I need to do. No stress or gray areas whatsoever! Making and buying a guitar shouldn't be so complicated. Ultimately, all that matters is the music being produced by it. 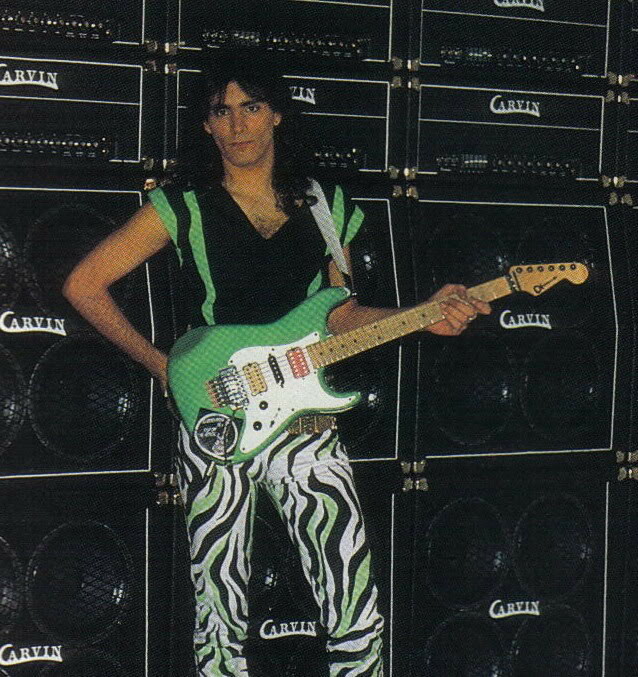 Looking at this Charvel prototype - in person and in the photos - I can't help but wistfully reminisce back to the mid-80's when the guitar I really wanted was that "Green Meanie" mongrel Charvel that Grover Jackson built for Steve Vai. Well, something like that because I don't like green guitars. I also remember wanting 24 frets although that guitar had 22 like a normal Strat. That was also the first guitar I saw with the H-S-H pickup configuration when the rage back then was the H-S-S. In the mid-80's, there were many companies that were sticking their logos on the Strat headstock before Fender finally got the shape trademarked. Out of all the logos applied to that iconic headstock, besides the Fender logo of course, I always thought that the Charvel logo looked somehow right on it. Fast forward nearly three decades and it's a bit ironic that my favorite player and good friend is getting a signature model from Charvel that's a refinement of that original Vai mongrel guitar. This is something I could not have even imagined happening only a year ago. And I observe what is unfolding and think, "Wow... Who would of thought? I wanted a Charvel 'superstrat' with the real Strat headstock since the 80's." After Fender trademarked the headstock in the late-80's, the company cracked down hard on anyone using the trademarked headstock. 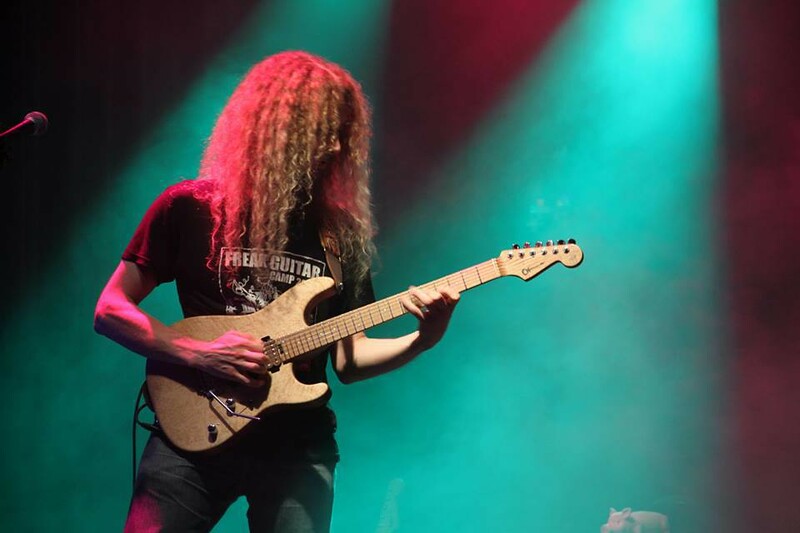 Charvel, under IMC, became an irrelevant brand and essentially disappeared for a while. How ironic that Fender would acquire Charvel (along with Jackson) in '04 and use the Strat headstock on some of their old hot-rodded models. And when the minute details are finally worked out and the Charvel GG Signature Model is officially released, I'm on the list to get one of the very first units coming off the production line. I'm thinking, "Wow. How cool is that?!" After nearly 30 years I finally get the guitar I've always wanted that is a signature model of my favorite player of all time who I work with closely and is a good friend. Whew~ Pretty surreal. Well, all I can say is that I count my blessings. Another nice photo from the NYC show courtesy of John McNally. The shape of the guitar's body reminds me a little of a Washburn N4, in that the lower cutaway is a little deeper than usual to accommodate the extra two frets. Otherwise, it's classically very Strat-like, isn't it. Nice pic, BTW. Did I read that Nuno's tapping style was an influence on Guthrie at one point, or have I imagined that? 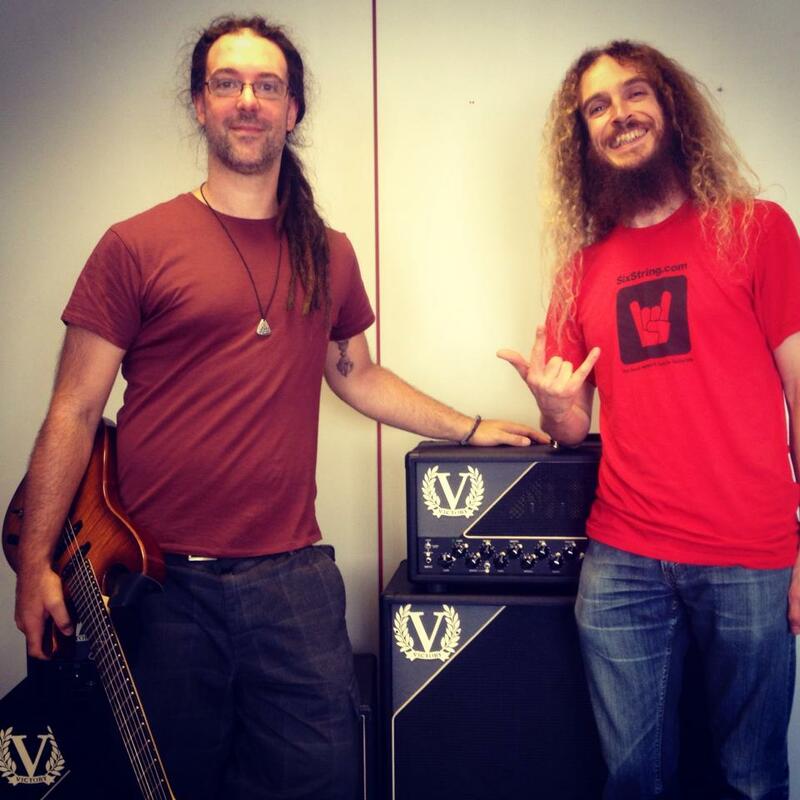 On a different note, have you spoken with Guthrie about how he found the two Victory amps he was using on the Steven Wilson tour? Yes, it essentially is a Strat body. I thought that perhaps it'd be a Dinky-style body but those sharper body styles never match up quite right with the Strat headstock. BTW, the upper-fret access is absolutely superb on this guitar. As Guthrie said, it's as if the heel isn't even there. Not sure about the Nuno tapping influence but that doesn't surprise me. His tapping style wasn't the run-of-the-mill EVH-style of tapping triads across the neck. It was more "integrated" in a smooth manner with whatever else he was doing and Guthrie's tapping style is very much in that realm as well. I think Guthrie picked up some tapping ideas from Reb Beach as well. I always loved Reb's style. All I know about the Victory amps is that the designer is Martin Kidd, who did a lot of the circuit designs and engineering for Cornford. That's where the "MK" comes from for the MK50 and MK50 II amps that Guthrie played for many years. Where it goes from here, I have no idea. Guthrie makes up his own mind when it comes to gear and has a very clear idea of what works and doesn't for him. From Guthrie's FB page. Seems he just picked up a Victory amp with a new cosmetic design change. I really look forward to hearing Guthrie through this amp. Of all the different amps I've heard Guthrie play through, I've always thought that he sounded best for what he does through the Cornford MK50. The Cornfords definitely weren't for me.